After a bad fall down the stairs I have suffered with lower back pain for some years now and have even had to take time off of work with it. 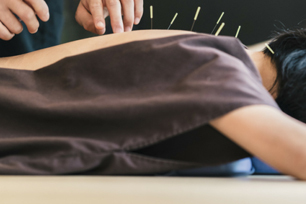 Have tried many of the recommended methods to strengthen it such as swimming and pilates but after a recommendation from a friend I decided to give acupuncture ago. I have never been particularly nervous around needles but I have to say that I was extremely anxious before my first session. It turned out however, that my worrying was unfounded and I was made to feel totally relaxed and didn't even feel a thing! Have been regularly attending sessions for a few months now and I have to say that I am frustrated at myself for not trying it out sooner. The almost constant back pain I used to experience has now reduced significantly which has resulted in improvements to all areas of my life. I can now make my own bed, get the washing out of the machine and bend down to pick something up without fear of my back suddenly incapacitating me. They sound like such simple things but you would be surprised at how much not being able to do them for yourself can impact you.